It was a late afternoon in the summer of 98, when I was studying a course in computer. Along with my two friends we decided to eat at the neighboring hotel. Tiffin are quite common at all times but eating out was not so common then. I used to get my regular 100 Rs as pocket money. Amma has been giving me since I started college. Not that I spent much other than the petrol for the two wheeler. Having decided to eat, I was apprehensive if parents would object to me eating out. We were never encouraged to eat out and we never even thought of doing something without their knowledge. But are there times as first always right. I think it was one of those firsts. Of course until much later, I never confessed to having indulged in a sinful feast on dosas back from institute. 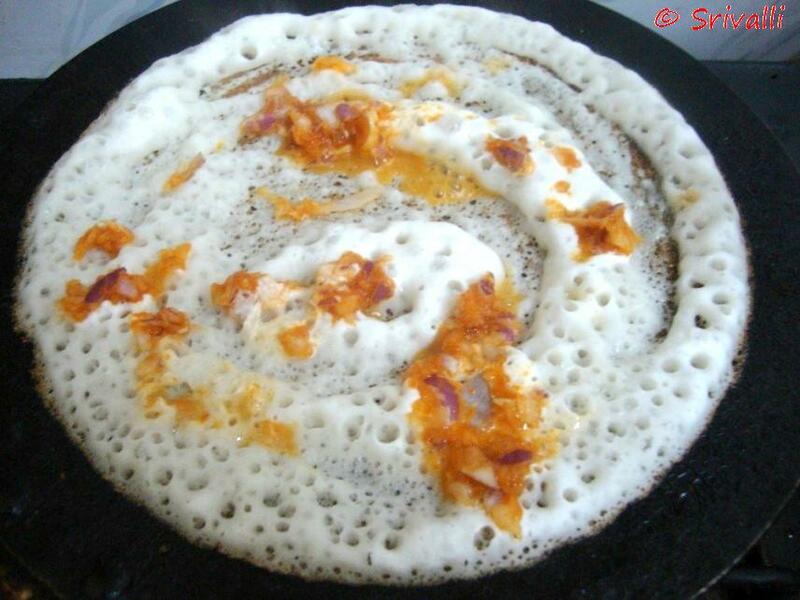 I have always been fond of dosas, be at home or outside. So it was natural that I order a Dosa variety. Browsing through the menu card, my eyes kept going back to the Podi Dosa on the menu. 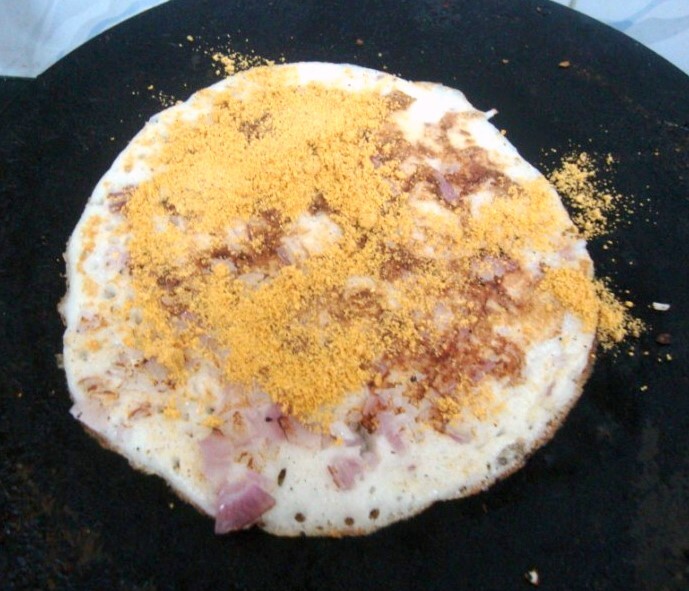 Being so crazy of the podi that Amma makes and dosas in general, I was at lost imaging how yummy it was going to be. Believe me, the dosa that came finally to my table, kept to its fantasy! Share I did, many years later. Still Amma was candid enough to ask where I had that. I had to gulp the details and just tell her how it was made. The long lost happiness finally came in when I was able to recreate the magic at home. Of course for all the flowing adulation I am bestowing on this, it is natural this type is a common fare at most homes, still it was something that had caught my attention. And if even after nearly a decade and half, if the mind feels the satiation, I am sure it was very delectable. I must say this most surely falls under the Bachelor feast as it is something one can do within minutes, provided if one can assemble the required ingredients in short time. There is no ingredient at all. Get yourself a bowl of Dosa batter. Once done, flip on the other side, allow it to cook. Simmer for couple of mins for the onions to get browned. Wasn’t that quick? Believe me it is surely heaven on a plate! 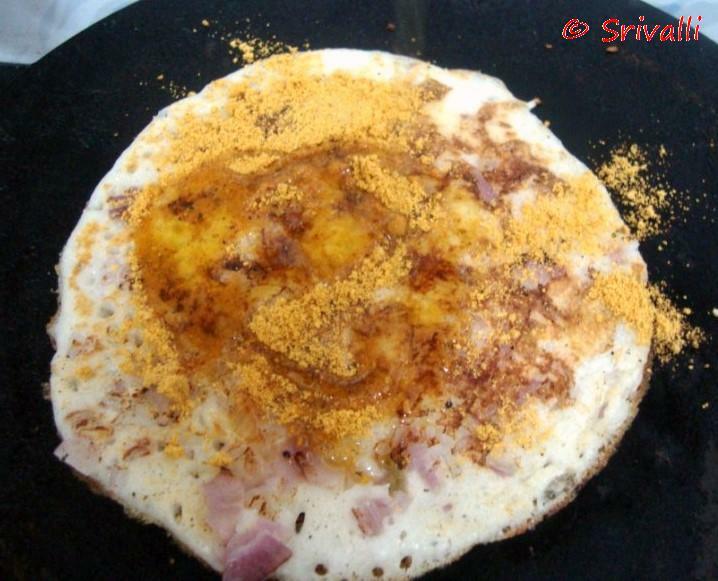 Next one on the plate is a simple Karam Dosa, which is same as the Erra Karam Masala Dosa but even simpler! 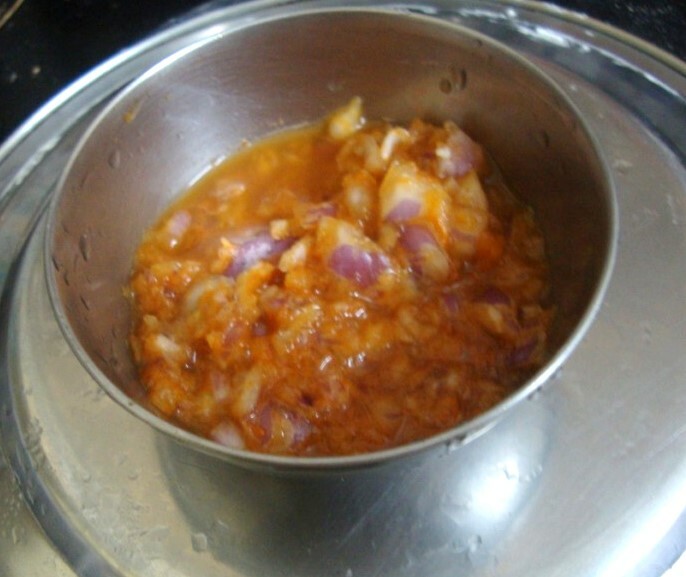 Pour of ladleful of Dosa Batter, spinkle a spoon of this Onion, Chili mix over the top. Flip onto the top side down for it to get cooked. Once done turn it back again. 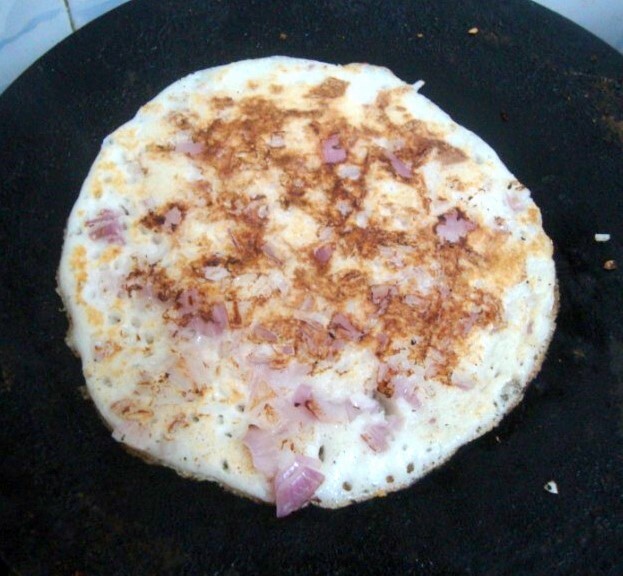 This is different from the Erra Karam Dosa as that was ground, while this is even more quick! Hope you enjoyed these simple yet very satisfying Dosa varieties! I love this too…yummmm making me drool and I just had my dinner!! Gosh How i would love to have that now..second dinner! !..only no dosa batter! Yum..I love dosas of all kind too. I have said this before on my blog,but still here goes.In Ernakulam[my home town],there's a Thattu kada,or a roadside eatery[which has become sort of a restaurant now] called Pai's Thattukada and they serve 36 varieties of dosas..yes.I am a big fan of theirs,much to my amma's chagrin and I love their Kutti dosas,Masala dosa and Ghee dosa.I make it a point to have food from there at least once when I am in Ekm. I've heard there's a similar joint here,in T-nagar which serves a variety of dosas? ?I remember so well coz their Podi dosa is quite famous it seems..did you have it from there? ?LOL!